CNC Swiss Machining is the fastest growing segment in today’s machine tool market. However, there are not enough skilled machine operators available to sustain this growth. SwissAssist can help bridge this gap by offering PartMaker SwissCam training as well as CNC Swiss Machine training. 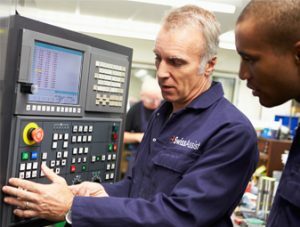 PartMaker training is offered at your facility using your machines and prints in a “real” working environment. We can provide start-up training or build upon the foundation from prior training. A CNC Swiss machine works only as well as the operators and programmers who run it. To enable maximum productivity, SwissAssist provides detailed instruction from the basic principles to the most challenging Aerospace and Medical applications such as thread whirling, helical milling and polar milling to name a few. Contact SwissAssist to set up training for your company needs.